A Place to Be was a monthly creative arts evening of spoken word, dance, music and song, all embracing the themes of belonging, identity and inclusion (2013 – 2015). The aim of A Place to Be was to provide a safe space for people from every walk of life especially those who may feel excluded because of their skin colour, sexual orientation, age, culture or mental health issues. Will be the host of A Place to Be and will also perform. Sharon is a singer/song writer whose music could be described as Irish -Soul folk music with reggae influences due to Sharon’s Caribbean heritage. Moya Roddy is a writer and meditation facilitator. She feels the two complement each other as it is necessary to make the inward journey of knowing oneself in order to be able to reach out and touch others. She has published a novel The Long Way Home as well as numerous short stories and has written for television, film, stage and radio. She will read from her collection Other People together with some poems. Bernadette Divilly, dance artist and special guests will introduce “Walking Wisdom Woodquay” a creative project bringing together dance, architecture and community participation. It is a project about, relationship with ourselves, each other and place, introducing the themes of inclusion, identity and belonging. 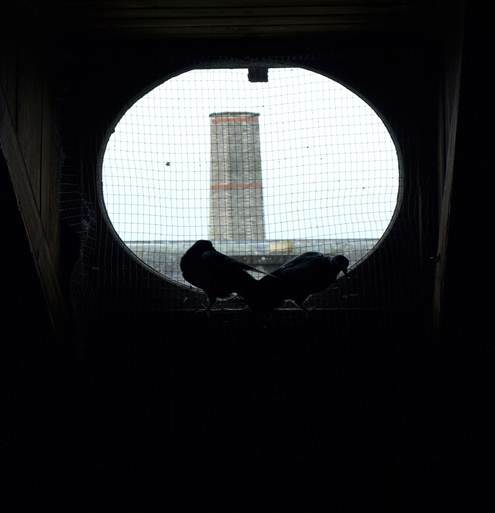 Bernadette will share why Woodquay is an inspiring place to investigate – using the wisdom of the body and simple pedestrian action to generate dilemmas and solutions for urban regeneration. She will be joined by special guests who have an in-depth local knowledge of Woodquay and an invested interest in the project. “Walking Wisdom Woodquay” is a creative project bringing together Dance, Architecture and Community Participation. Bernadette Divilly, together with the Woodquay community and ‘Design with Communities’, an initiative by Galway City Architects Office, will investigate and map the Woodquay area of Galway City using the wisdom of the body. The intention is to enable the local community to engage with urban design through Arts engagement. Is a singer-songwriter and multi-instrumentalist. Originally from Miltown Malbay, Co Clare, she is steeped in Irish traditional music. Her albums include Mam Cheol (Clo Iar-Chonnachta, 1992), The Idle Road (with Clare Sawtell), 2002, Jockey to the Fair (University of Limerick, 2005) and Dochas Bhride (2014). She is currently working on a new album of original compositions. She lives near Kinvara. Lives near Kinvara, Co Galway. She grew up in the UK (Shrewsbury and London) and has lived in Ireland since the early 90’s. She is a musician (cello and piano) and teaches at Coole Music, Gort. She was shortlisted for the WOW! Award in poetry 2010 and has been published in Crannog Magazine, THE SHOP and The Stony Thursday Book. Her first collection of poetry, The Next Dance, was published by Wordsonthestreet in June 2014. Sharon Murphy will be the host of A Place to be and will also perform. Sharon is a singer/song writer whose music could be described as Irish – Soul folk Music with reggae influences due to Sharon’s Caribbean Heritage. For many years now Patricia Begley has been writing to simply live. Not to live in a trudge through hours and days and years, but to live each moment ransomed by joy, curiosity, love. To experience the intimacy of time’s gift, to eat one dinner a day each day, every sip and morsel a delicious glory, in addition to and supplementing all that came before and all still yet to come. Patricia will read some of her new work which touches on the extraordinary in the ordinary. Nigerian living in Galway for over five years is a poet, stage actor and author. He was a feature reader at the Over the Edge Reading last year and short-listed for the 2013 Cuirt/Over the Edge Showcase reading. Adedotun will be reading from one of his two books and reciting some of his poetry, looking at themes of colonialism and migration. Prionsais comes from a long line of Connemara people. Her parents and grandparents taught her the traditional songs, tunes, poetry, drama (Sean Nos meaning Old Way or Old Style) from early childhood. Sean Nos is still alive and well among the people of the various Gaeltachtai in this country. Elizabeth is a fiction writer interested in women’s issues including retrieval of ancient women’s (her) stories. She is currently in the process of writing a novel about a time travelling witch. She has had success in short fiction, published in Moth Cranog and Force Ten as well as winning Jonathan Swift and coming 3rd in Dromineer National literary competitions. R J Samuel was born in Nigeria, to Indian parents from Kerala. She moved to Ireland in 1984 to complete her medical studies and has remained there since, apart from a 3-year episode in the southwest of France. She is an Irish citizen and now considers herself almost Irish as well as almost Indian. She will be reading excerpts from her novels and short stories. 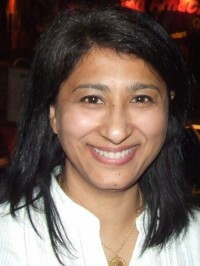 She has published three novels so far (set in Galway city and Connemara and in Kerala, India): Heart Stopper – (Medical Thriller) – February 2012, Falling Colours – The Misadventures of a Vision Painter – (Magical Realism) – June 2012, Casting Shadows – The Further Misadventures of a Vision Painter – (Magical Realism) – January 2013. Her short stories have been shortlisted for the 2011, 2012, and 2013 Over the Edge ‘New Writer of the Year Competition’ and she was the only entrant to have both her fiction and her poetry long-listed for the Doire Press ‘1st Annual International Fiction and Poetry Chapbook Competition’ in January 2012. Her fiction entry, ‘The Vision Painter,’ went on to be shortlisted for this competition. 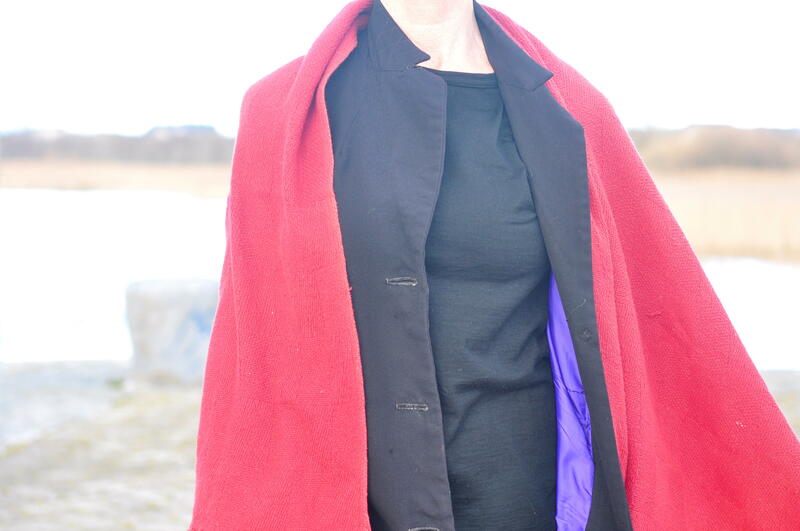 Bernadette Divilly is Somatic psychologist/Dance Movement Therapist currently based in Galway. She also works in the field of socially engaged choreography. A graduate from Naropa, University Boulder CO. USA; she has also studied Body Mind Movement with Mark Taylor in Mexico City and Dance Composition most recently with Barbara Dilley. She teaches Somatic Psychology and Dance Movement Therapy. Bernadette developed Dance Diversity. In this presentation Bernadette will present Dance Diversity with a focus on skin touch and intelligence of our skin as a natural boundary and a container for our sense of being. What do we really mean when we say he/she has a thin or thick skin? 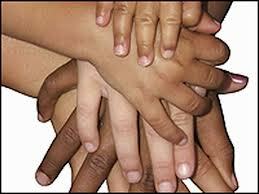 And why has skin colour anything to do with power? 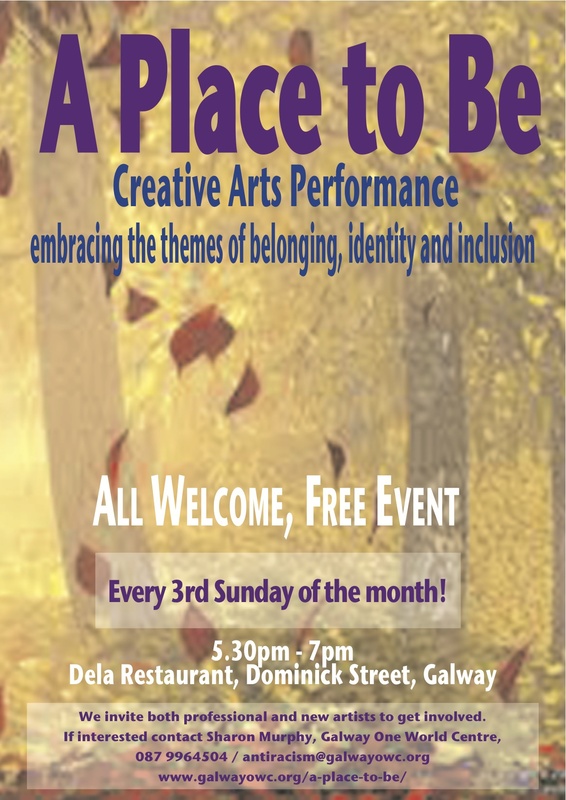 Our next performance of A Place To Be will be Thursday 14th November, 6.00pm-7.30pm at Amnesty International Café, Galway, 2/3 Middle Street. Free event, all welcome. Sarah Clancy is from Galway City and has written two collections of poetry; Stacey and the Mechanical Bull (Lapwing Press Belfast 2011 ) and her current collection Thanks for Nothing Hippies (Salmon Poetry Cliffs of Moher2012). Her poems have been widely published in Ireland and in translation in Mexico and Slovenia. She has won or been shortlisted in many Irish poetry competitions for both performance and page poetry and has recently begun to write and publish fiction. Vicky’s ‘day job’ as a development education worker involves working with schools, youth and community groups on issues like racism and gender oppression. However the greatest chunk of learning about equality has come about as a parent of two boys. This evening Vicky will share some fictionalised accounts of adventures in the gender politics of parenting, and, if you’re sitting comfortably, will show slides from vintage Ladybird books that very helpfully set out ideas for How to be a Boy. Our next performance will be Thursday 10th October, 6.00pm -7.30 pm at Amnesty International Café, Galway, 2/3 Middle Street. All welcome. Sings with the Lismorahaun Singers, a community choir based in Ballyvaughan, County Clare. She has been taking singing lessons from Archie Simpson, the choir’s founding conductor and inspirational singing teacher for the past ten years. Finding her voice at fifty has been one of the most surprising and exciting experiences of her life! She has her first solo CD coming out soon. Noel Lennon, pianist, musician, director, teacher, choral and orchestral conductor and founder of the Music Theatre West. Is a poet, playwright and songwriter, living in Galway. 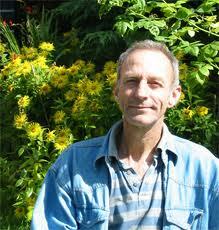 He works in development education, exploring global issues through drama and creative writing. His writing reflects a keen interest in music as well as a quirky personal-political response to life’s challenges. 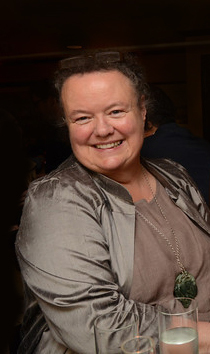 Rosanna Mc Cafferty has lived in Galway for over 20 years, though originally from Belfast. She is a working mum with an 8 year old son called Ultán, married to Laurence. She enjoys singing informally and likes to attempt painting occasionally. Sharon, the host for the evening, is a singer/song writer whose music could be described as Irish -Soul folk music with reggae influences due to Sharon’s Caribbean heritage. For many years now Patricia Begley has been writing to simply live. Not to live in a trudge through hours and days and years, but to live each moment ransomed by joy, curiosity, love. To experience the intimacy of time’s gift, to eat one dinner a day each day, every sip and morsel a delicious glory, in addition to and supplementing all that came before and all still yet to come. Patricia will read a piece entitled ‘Belonging’. Prionsais comes from a long line of Connemara people. Her parents and grandparents taught her the traditional songs, tunes and poetry. This tradition is called “Sean Nos” meaning “Old Way”. Sean Nos is still alive and well amongst the people of the various Gaeltachtai in this country. Prionsais will be singing Sean Nos. Michael is a writer and activist who has spent most of his life in Latin America. He has published several books, “True Crime: Rodolfo Walsh and the Role of the Intellectual in Latin American Politics”, ”The Battle of Venezuela” and “The Price of Our Souls‘, about Shell V the People of County Mayo. Michael McCaughan will read from his biography of Rodolfo Walsh (1927-77) a writer and revolutionary from Argentina, ambushed and killed by the military in 1977. Rodolfo’s life story follows historic events of the 1950s, 60s and 70s, from the Cuban Revolution, where he decoded secret cables outlining plans for the US invasion (1961), to the literary revolution of the time. His short stories and crime fiction won many awards and critical praise and he was on track to join the club of major writers (Gabriel Garcia Marquez etc) but he gave all that up for a very different story – the revolutionary moment unfolding around him…. Adedotun Adekeye , a Nigerian living in Galway for over five years , is a poet, stage actor and author. He was a feature reader at the Over the Edge Reading last year and short-listed for the 2013 Cuirt/Over the Edge Showcase reading. Adedotun will be reading from one of his two books and reciting some of his poetry, looking at themes of colonialism and migration. Sharon Murphy, host of A Place to Be, is a singer/song writer whose work addresses the issues of power and oppression. Sharon’s music could be described as Irish – soul folk music with a reggae influence due to Sharon’s Caribbean heritage. Much of Sharon’s music comes out of her personal experiences growing up in Ireland. Sharon has featured on an number of radio and television programmes performing her music and talking about being black/Irish. Programmes like RTE’s “States of Fear documentary”, produced by Mary Raftery and Mono, Ireland’s first intercultural television programme.